It was a difficult night on January 28th when Ada Olmedo heard about the fire at Mission and 22nd streets. This was where she had been employed for ten years at the local Popeye’s. All changed in an instant. Ada’s daily routine was no more. The life she knew was gone. Two days later, Ada found herself at a city-run forum for the 36 displaced businesses and their 71 employees, with the venue the community room at the Mission police station. The city invited MEDA’s Business Development and Workforce Development teams, the latter represented by Job Coach Robert Lopez. After intake forms were completed to assess needs, Ada decided to enlist Lopez in her job search—an astute move on her part, as Lopez immediately got to work, knowing the urgency of the situation. 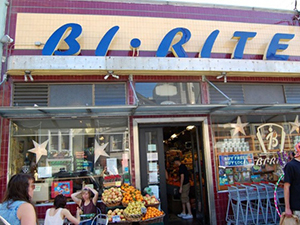 After refining Ada’s resume, Lopez worked his connections and ascertained that Bi-Rite Market’s 18th Street location in the Mission might be the ideal place for his client. The business had even generously donated food to tenants of the fire who were staying at the Salvation Army shelter on Valencia Street. Lopez also set up Ada with MEDA’s Financial Capability team so that they could do a benefits screening. This led to Ada being offered benefits for herself and her one-year-old. “Robert Lopez helped me very much. I appreciate all that MEDA has done for me,” gratefully exclaims Ada. After being guided through four interviews by the MEDA coach, Ada was hired at Bi-Rite. Her first shift was yesterday and the new employee is already making an impact.